This is the other version of the Mercury Cyclone Spoiler II (if you’re linking here from somewhere on the site, you can read more about these cars above). It’s interesting that Ford would name a car after Dan Gurney – he wasn’t a NASCAR regular (even though he has one of the highest winning percentages in NASCAR history at 31.25% – the highest among drivers who started more than 3 races). He ran races between 1962 and 1968 – just 16 races. And he won 5 of them (and he did drive Mercurys for owner Bud Moore). Pretty incredible. Dan Gurney is, hands down, one of the best race car drivers that America has ever produced. Mercury built 218 Gurney Specials for 1969 in honor of him. The blue trim on this one sets it apart from the Yarborough Special. Both of these cars look incredible and are likely coming from the same home. You can read more about this one here and see what else Mecum has to offer here. 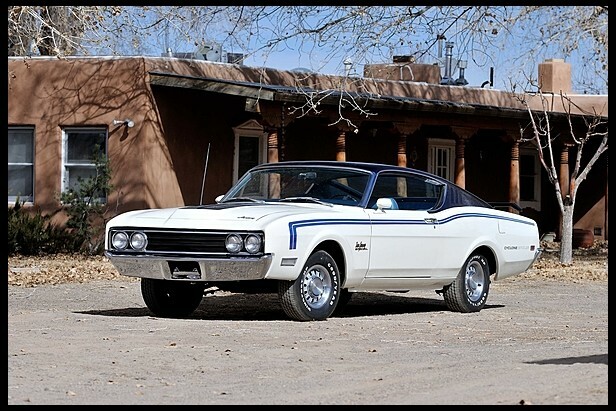 This entry was posted in Uncategorized and tagged 1969, auctions, cars, classic cars, cyclone, gurney, mecum, mercury, nascar, special, spoiler ii by classiccarweekly. Bookmark the permalink.